extremely helpful staff. we were only in town for a 4 days so being centrally located was ideal so we could maximize our visit. great price. we were looking for two bedrooms and two bathrooms so apt was perfect. highly recommended. View of cathedral was wonderful, friendly and helpful staff. Outstanding location, large apartment , comfortable and roomy. Very comfortable beds. Second time we've stayed here. This was the most amazing stay. The pictures do not do it justice. The view, location, cleanliness, furniture, art were superb! I can not believe we were so lucky to have stayed here. I did not want to leave. Apartment had a great view, great amenities and nice decor. Waking up and sleeping to the cathedral views was an unforgettable experience. Location, view, very clean and a big ... love it will stay again.. Fantastic location, comfortable setting for a family with teenage boy. The bike hire recommended by Puerta Cathedral was pretty close and biking from Puerta Cathedral all around town was just perpect. Spacious rooms, amazing location next to the cathedral. Location was amazing, right in the heart of the Cathedral/monument district. View of cathedral was breath taking and suite was spacious and comfortable with modern ammenaties. The rooftop terrace was also very enjoyable. Lock in a great price for Puerta Catedral Suites – rated 9.2 by recent guests! Puerta Catedral Suites This rating is a reflection of how the property compares to the industry standard when it comes to price, facilities and services available. It's based on a self-evaluation by the property. Use this rating to help choose your stay! 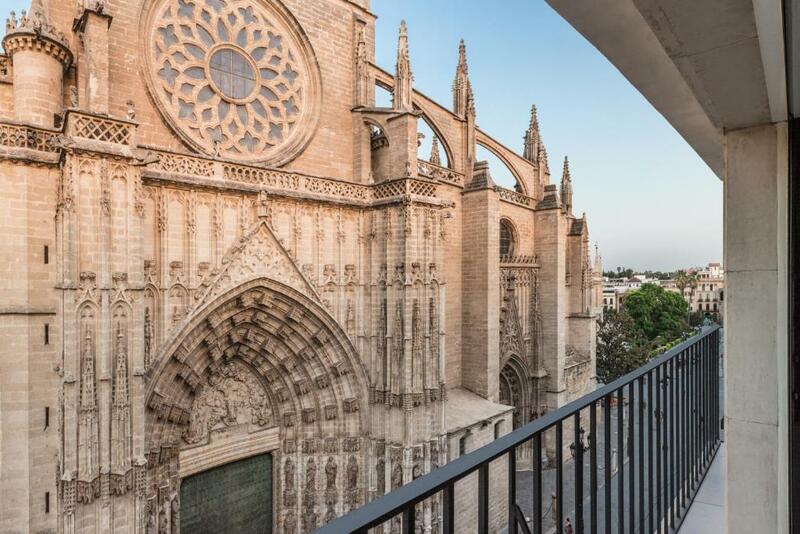 One of our top picks in Seville.Just in front of Seville Cathedral, this property is set on a pedestrian-only avenue. Puerta Catedral Suites features air-conditioned apartments with free Wi-Fi and private balcony. Puerta Catedral Suites is within walking distance of the city’s most tourist places. The Giralda Tower is only 550 feet away, and Real Maestranza Bullring can be reached in 5 minutes by foot. Each modern apartment features parquet floors and original paintings from a local artist. There are 2 bedrooms, 2 private bathrooms and a living room with a flat-screen TV. All apartments at the Puerta Catedral include free Wi-Fi and an iPod/iPhone docking station. The open-plan kitchens have a washing machine, a microwave and a fridge. The cathedral can be seen from the living room. The nearest tram station is Plaza Nueva, which is 950 feet away. San Pablo Airport is less than a 20-minute drive away. 뀐 Located in the real heart of Seville, this property has an excellent location score of 9.9! When would you like to stay at Puerta Catedral Suites? This apartment features 2 bedrooms, one with a double bed and the other with twin beds, both with a private bathroom. The spacious living room has a TV and offers views of Seville's Cathedral. There is also free Wi-Fi and an iPod and iPhone docking station. The well-equipped kitchen includes a washing machine, and the apartment can be reached by elevator. 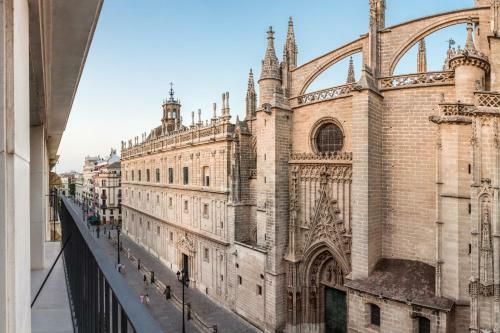 Located on Avenida de la Constitución in front of Puerta de San Miguel de la Catedral, the 5 suites all have views of the Cathedral of Seville and are located on different floors of the building to offer the greatest exclusivity and privacy possible. We love the spanish tradition and culture, art, music and of course, Flamenco. We also enjoy the andaluzian cuisine, and we can recommend you some of the most famous and best restaurants in Sevilla, a city known for the varieties of restaurant, from the most ancient and pure andalusian cuisine till the modern, fashioned and new kind of tapas, that mix the past and the presend of our cuisine. Puerta Catedral Suites is located just in front of the Catedral, so you can reach everything important just a few steps away from your apartment. 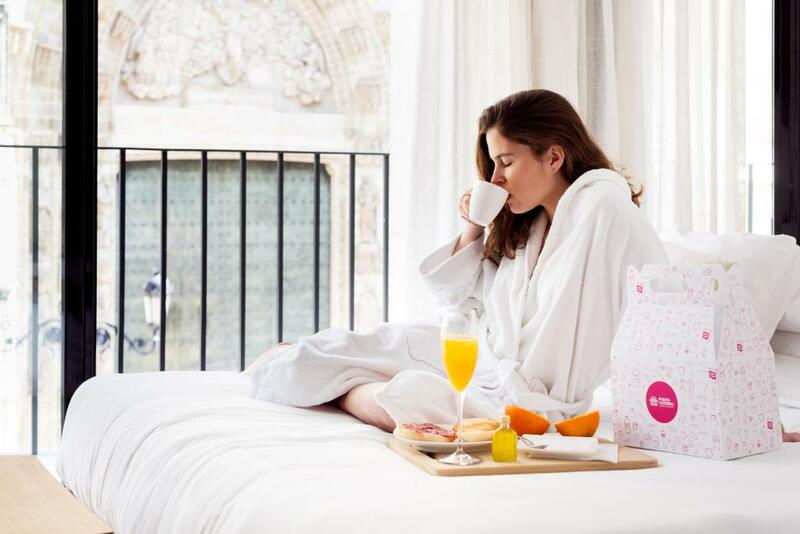 House Rules Puerta Catedral Suites takes special requests – add in the next step! Puerta Catedral Suites accepts these cards and reserves the right to temporarily hold an amount prior to arrival. Please inform Puerta Catedral Suites of your expected arrival time in advance. You can use the Special Requests box when booking, or contact the property directly using the contact details in your confirmation. Very good location with fabulous view of the cathedral. Friendly and helpful reception. Apartment comfortable and well furnished. Plumbing. Shower sounded like an angry bee! The area is noisy during the evening. Location directly opposite the cathedral. Fantastic location and view, lovely helpful staff and really comfy beds. Shower was dodgy - water could be very hot in one instance & then turn very cold in next; also water pressure was weak. No shower gel provided. Washing machine also very old-fashioned (the kind where you have to close the metal tub inside yourself before closing the lid) & didn’t work very well, which was bummer cos clothes came out rather damp and took a Long time to air-dry in the absence of a tumble dryer. Location was great, apart from the fact it was slightly inconvenient if you have luggage as you couldn’t be dropped off/picked up directly from the property as it is located on a pedestrianised street. Also, 2-bedroom & 2-bathroom unit has proper beds (for max 6 persons) without needing to sleep on sofa bed unlike many other apartments in Seville with this configuration.